German middle Dominik Britsch, 26-0, take on Spain´s Roberto Santos for the vacant EU title February 25 at the Porsche Arena in Stuttgart. Britsch vs Santos will go ahead as a featured bout on the undercard to Alexander Povetkin vs Marco Huck. Santos, "El Tigre de Benidorm" have a mixed record but stopped Frenchman Francois Bastient earlier last year and lost a close decision to Nikola Sjekloca. There is a problem with this fight though - and it´s likely to be solved in the week to come: Santos lost his last fight and need a win to qualify for a title fight and will have a suitable tuneup next weekend to secure the fight vs Britsch. 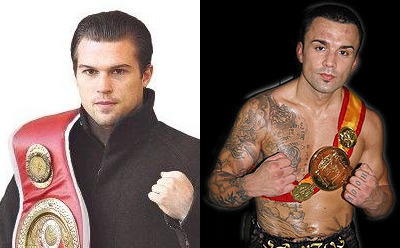 This also means that Britsch will not defend the IBF I/C title against fellow German Benjamin Simon March 9 as Arena had planned after winning the purse bids for this fight.